I don't know about you, but I'm not much of a diamond gal. Sure, they're gorgeous, but they're just so...plain. I would much rather have a jewelry box full of colorful semi-precious gemstones. Besides my birthstone Amethyst, Sapphire is my second favorite gemstone (I also LOVE Opal). The deep, blue color is so intense and mystifying and full of depth. 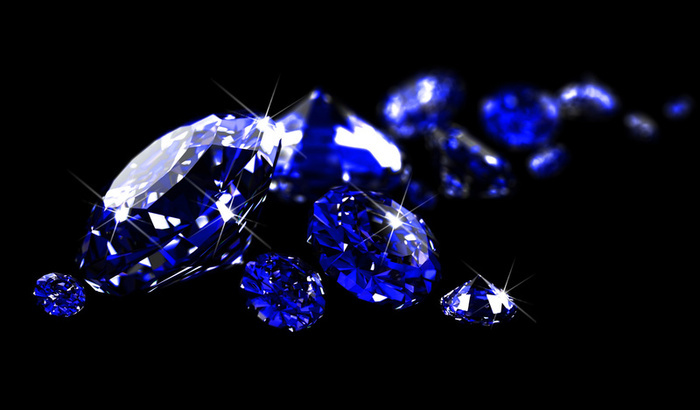 Many people don't know this, but sapphires come in many different colors, including purple, pink and even red. So I decided to create a look inspired by this lovely stone! MINI REVIEW: These long and intense lashes are not only gorgeous, but they add tons of drama and length without being too over-the top. The V-shaped hairs add a fun a whimsical feel. They are SO lightweight and comfortable to wear, too. I hope you enjoyed this look and will hopefully try it out! If you have light brown eyes like me, then you must try it. They will POP. Have a great week, loves! See you all again soon! Blue eyeshadow somehow doesn't work for me, but you make it so beautiful! looks amazing ... as always! Oh I love this look, it's stunning! Absolutely gorgeous! Love the colour combination and the smokiness. Very pretty. I especially love the warm brow highlight. The whole things works awesome. outstanding eye make up... But did you use also photoshop? Thank you. Yes, I use photoshop to remove imperfections such as redness in my eyes, fall out, stray lashes, etc...and also to brighten up the image. The makeup is all real though! This is an unbelievably gorgeous look! That shade of blue looks incredible with your brown eyes. So pretty!! Wish I could wear color like this! This is gorgeous, as all of your other looks are. & I love your creativity with the names, so clever! oh my goshhh so pretty! This looks is gorgeous, as all of those you make. I love dark blue shades for eye looks. I just stumbled across your blog. I'm so glad I did! Your looks are lovely, and I'm green (or blue) with envy. I am a makeup addict, but much less adept at applying it, so I tend to be more neutral. Your photography is stunning...making it an eye-catching (pun intended) blog. We share a birthstone! (And Sapphires are my younger sister's!) I like diamonds myself, but not so much on my eyelids. This is a beautiful look and definitely very mysterious and alluring. Love it! Wow, that's is insanely sweet! THANK YOU! PS... YOU are gorgeous too. :) Thank you again for these lovely how-to's. I'm new to your page... and you're going right at the top of my make-up blogs!! Can you give more instruction or a tutorial I just bought all the makeup to crest this look. Thank you! Thanks for writing about it, Free Online photoshop is useful to edit these photos and then upload to your blog post.